Update : There were many users who reported that their album art's got vanished from the player. It was Play Music App bug, Google has now released a new update 5.6.1617P which resolves this (you can find the new APK below). You may need to clear data and restart the app if album art still doesn't show up. 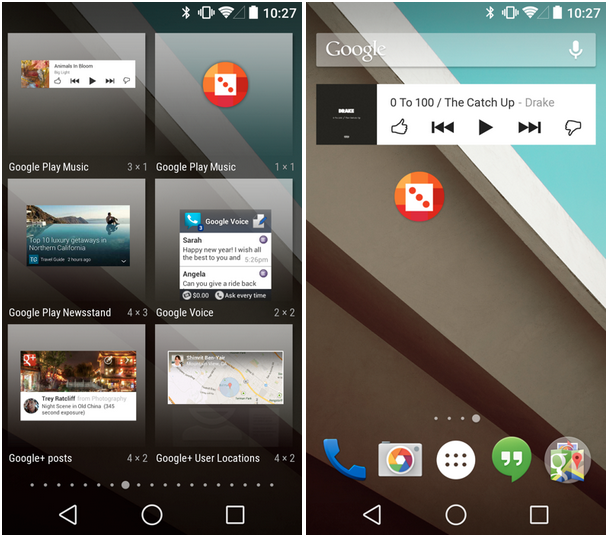 Google has once again opened the gates of updates to their apps, and first was YouTube and now Play Music. Who knows what else. The new thing for the music app is the widget , where one already has undergone a welcome facelift , while it has also been added a new one, which is none other but a shorthand for "I'm Feeling Lucky", which will initiate a quick mix of songs that we think will like Play Music. However, Google didn't pushed the official changelog, so if you noticed anything new, tell us in the comments. On the other hand below there is the apk the file to download if you would like to immediately upgrade your copy of Play Music, without waiting for the slow roll-out of the Play Store.